WEST MELBOURNE, Florida - A 14-year-old girl was was reported as a runaway from Miami Gardens, Florida was found deceased and only partially clothed on Tuesday in West Melbourne, Florida. According to West Melbourne police, patrol officers were dispatched to an apartment building located at 89 NW Irwin Avenue on Tuesday, January 10, 2017, at approximately 6:14 p.m. 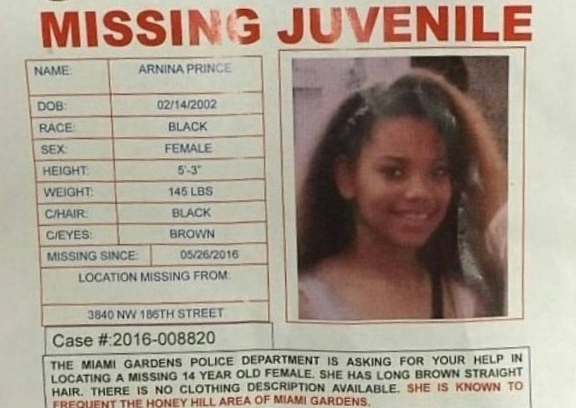 The responding officers found the teen, later identified as Arnina A. Prince, in a bathtub in one of the apartments. Fire rescue crews arrived thereafter but attempts to revive her were unsuccessful and she was pronounced deceased. Officers initially received conflicting information from multiple bystanders who were on the scene. Some of the information indicated that the victim may have been sexually assaulted and strangled. As with all death investigations, the crime scene was immediately secured. Due to the suspicious nature of the death, Homicide Detectives were summoned to the scene to assume the investigation. Detectives have since conducted multiple interviews, executed a search warrant on the apartment, documented the crime scene, and worked with the Medical Examiner’s Office. Investigator say that preliminary findings did not reveal any evidence of strangulation or sexual assault. The final, official manner and cause of death will be determined by the Brevard County Medical Examiner’s Office. During the execution of the search warrant, police say that illegal drugs and paraphernalia were recovered. At this time, it is unclear to investigators if those drugs contributed to her death. No charges have been filed and no suspects are being sought. However, the case remains open and active as detectives await official autopsy results and conduct more interviews.